NOTE: Whole9 has zero vested interest in SeaSnax, or the sale of SeaSnax products. We are not financially affiliated with SeaSnax in any way, shape or form. We just like scoring good deals on stuff we like for our readers. Today’s post began in Honolulu, HI, when Melissa picked up a package of SeaSnax at the local Whole Foods. The package promised they would be “strangely addictive”, and after Melissa plowed through three snack-packs in as many days, she realized the product actually lived up to the hype. 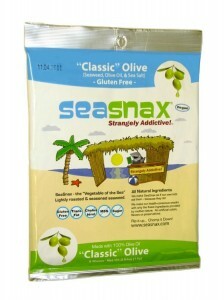 A few weeks later, we sent a note to SeaSnax, singing their praises and proposing ideas for how we could best collaborate to share the glory of the Snax with our readers. And today, our hard work (and seaweed-snacking) pays off… for you! The Paleo diet lists some decidedly unconventional food items by today’s standard – but seaweed? Trust us, it’s actually not as weird as it sounds. First, let’s talk about the nutritional benefits of seaweed – specifically, the nori or porphyra (red algae) from which SeaSnax are made. According to Subhuti Dharmananda, Ph.D. (Director of the Institute for Traditional Medicine in Portland, Oregon), seaweed draws an extraordinary wealth of micronutrients from the sea, including iodine, calcium, sodium, magnesium, potassium, iron, zinc, copper, and selenium. (In fact, seaweed has a large proportion of iodine compared to dietary minimum requirements. While actual amounts per product vary, the average sheet of nori is estimated to provide 70% of the recommended daily intake of iodine.) Red algae also contains vitamin A, vitamin C and vitamin B12 (although many scientists suggest algae conly ontains a close relative of B12, not the real deal our bodies need). Finally, seaweed lipids also have a higher proportion of essential fatty acids (EFAs) than land plants. Red algae have a high EPA content, a substance mostly found in animals, especially fish. While the amount of EPA and DHA in a sheet of nori varies with the level of nutrients in the ocean while the algae grows, one sheet of nori contains about 0.5 grams of Omega-3 fatty acids. Enter SeaSnax! They take porphyra (red algae) from the sea and turn them into sheets by a process of shredding and rack-drying. Then, they gently roast the sheets with 100% olive oil (no vegetable oil here!) and add natural spices like sea salt, garlic and chipotle. The final product has a crunchy, chip-like texture, a fresh (non-fishy) taste and, as promised, a strangely addictive quality. 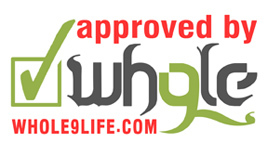 Whole30 Approved – and Free Shipping for Whole9 Readers! Nothing local? Not to fear! Thanks to the generosity of SeaSnax and our rabid pursuit of scoring cool deals for Whole9 readers, we managed to snag you all free shipping on SeaSnax from now thorugh year-end. We’ll also be bringing samples of SeaSnax to our upcoming Foundations of Nutrition workshop in Sumner, WA this weekend – lucky for our guests! So if you’re a little bit bored with your Whole30 snack options and looking for a crunchy treat that packs a nutritional punch, give SeaSnax a try today. And if you get addicted like Melissa did – don’t say we didn’t warn you. Reference: The Nutrient-Dense Eating Plan, Douglas L. Margel, D.C.